Cribs for Kids - Southern Tier Health Care System, Inc. Safe sleep matters for babies. Each year 3,500 infants die suddenly and unexpectedly during sleep time. Sadly, most of these deaths are preventable. Many infant deaths are due to accidental suffocation or strangulation from unsafe sleeping environments. As part of our Safe Sleep Initiative, STHCS is working to prevent sudden unexpected infant deaths by spreading the ABCs of Safe Sleep and by serving as a Cribs for Kids® partner organization. Apply for a Pack 'n Play crib from the Cribs for Kids program. Use a wearable blanket to avoid the risk of having loose blankets in the crib. Placing items in the crib with a baby puts him or her at an increased risk for accidental suffocation. It’s safest to have nothing else in the crib with the baby. No toys, no blankets, no stuffed animals, no pillows and no bumpers or positioners; just a firm mattress with a tightly fitted sheet. Always place your baby on his or her back to sleep. Babies who sleep on their stomachs or sides are at an increased risk of death from Sudden Infant Death Syndrome (SIDS). Babies should always sleep in a crib, never on a couch or chair or in an adult bed with parents or siblings. Babies who sleep in a bed with parents may suffocate in the soft sleep surface or the blankets and pillows. They also can be suffocated by an adult or sibling who rolls over on them while sleeping. Bed sharing isn’t worth the risk. Don’t overheat babies. If the room is a comfortable temperature for an adult, it’s a comfortable temperature for a baby wearing light sleep clothing. Keep the environment smoke-free for your baby. Offer a pacifier. Be sure the pacifier doesn’t have cords attached. Breastfeed safely. Don’t bring your baby into bed to breastfeed. Be sure to place your baby back in the crib when nursing is finished. Tummy time! A baby needs time to play on his or her tummy while awake to encourage physical development and prevent flat spots on his or her head. For information about how to create a safe sleep environment, please watch these videos. 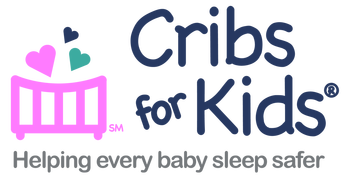 In 2016, to increase the impact of our Safe Sleep Initiative, STHCS became a Cribs for Kids® partner. Cribs for Kids® is a national organization that has been working since 1998 to prevent infant deaths due to unsafe sleeping environments. Through this partnership, STHCS is able to purchase Graco® Pack n’ Play portable cribs at a special price and has access to educational and promotional materials. STHCS has established relationships with local hospitals and health-care providers to identify families who are unable to afford a crib to provide a safe sleep environment for their baby. These families are referred to our organization which determines whether or not they qualify to receive a Graco® Pack n’ Play portable crib for their baby. During the first year of the Cribs for Kids® partnership we provided over 100 cribs and educational materials to low-income families who otherwise would not have the resources to provide a safe sleep environment for their babies. This program is helping babies in our communities sleep safely. For more information on Safe Sleep, please contact us using the form below. Thank you to the generous donors who help sustain the Cribs for Kids program. Click here for a list of donors who supported our Adopt a Crib Campaign! More Information on Cribs for Kids - Contact Us!